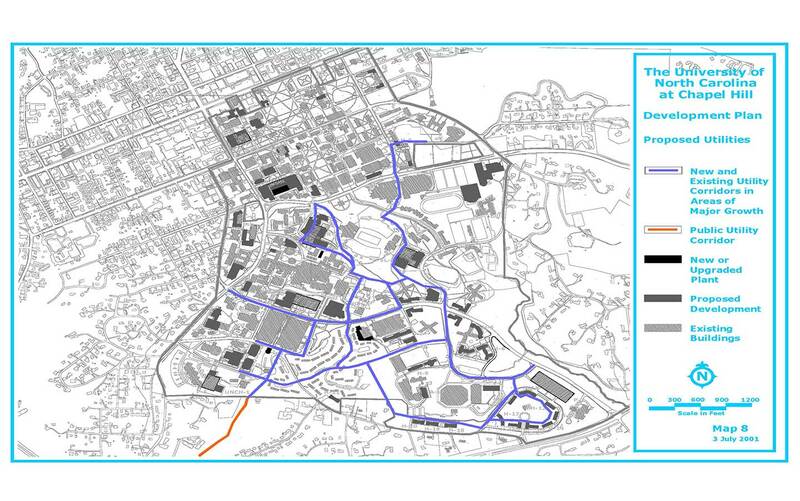 The Utility Master Plan component of the Campus Master Plan describes new utility infrastructure required to support the physical growth of the campus. It identifies new plant locations and utility corridors. The Development Plan includes improvements to the utility systems that the University currently owns and operates. Map 8 illustrates the location of a new production facilities and major utility corridors necessary to support the buildings in the Development Plan. Orange Water and Sewer Authority provides the University with water and sewer service, PSNC Energy supplies natural gas, Duke Power supplies electricity, and Bell South provides telephone service. All of these agencies have been consulted about the proposed Development Plan and have provided documentation that they are able to accommodate the University’s planned growth. Letters from OW ASA, PSNC Energy, Duke Power and Bell South are included in the Appendix. The University has demonstrated leadership in the area of energy conservation as recognized by the recent EPA award for the Co-Generation Plant’s combined heat and power technology. The University has recently formed a Sustainability Coalition and created a full-time Sustainability Coordinator position. The Energy Task Group of the Sustainability Coalition focuses on energy conservation practices at the University.